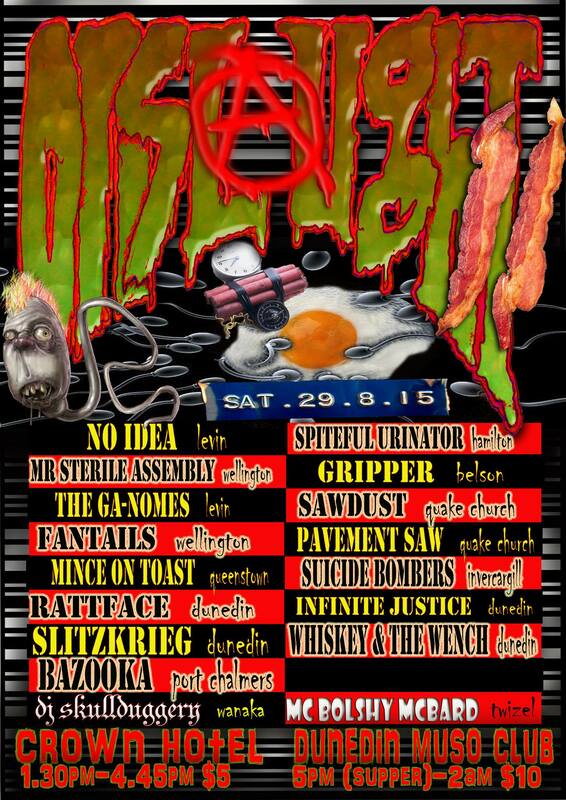 An amazing show to be playing at this weekend coming – the incredible Onslaught festival held annually in Dunedin. And this years line-ups is a genuine pearler!!! Organised by Mark from Bazooka this event is in its’ 11th year. It’ll be a full day of a vast array of bands from the south, but happily a little of the North gets in there as well. We think it’s extra brilliant that a couple of bands are from Levin! (Some say the Gore of the North). Levin, is after all, the home of the A.E.B, a mighty fine community venue and one of our particular favourite digs to play. it is also the home of the legendary NZ Punk band No Idea! It’s possibly been almost 30 years since No Idea last played Dunedin, so this one is gonna be one for the books! 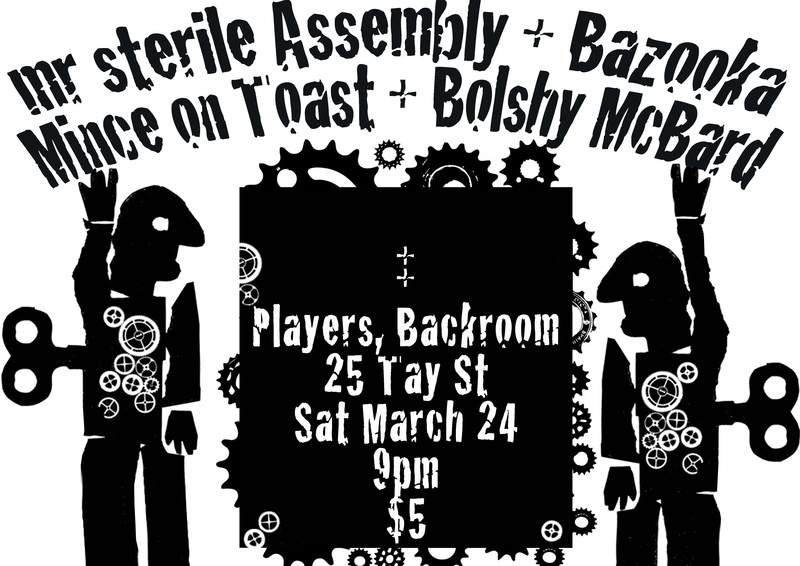 1.00-2;00 DJ Skullduggery (and between each band). 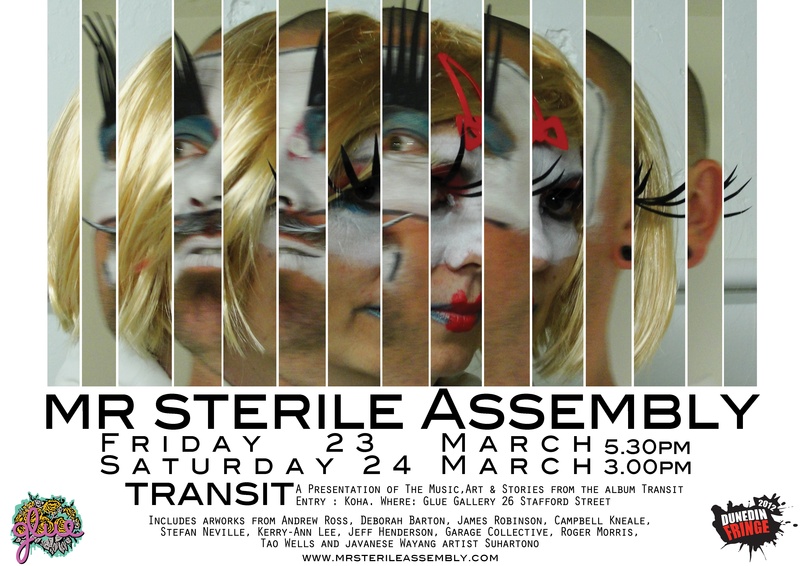 “Glue Gallery and the Dunedin Fringe Festival gladly welcome the Wellington based, Outsider Punk Duo ‘MR STERILE ASSEMBLY’ to Dunedin for a dynamic presentation of Music, Art, Performance and Stories. We’re at it again. In a couple of weeks, we’ll wrap out bits and pieces in cardboard and send them by plane to that Southern city Dunedin for the 2012 Fringe. The art will hang for the week leading up to the performance’s on the 23rd & 24th. Koha entry to the Glue Gallery for the talks. An in addition to this will be TWO other performances. The first is on the Friday 23 March at The Crown Hotel, Rattray St, Dunedin. Ourselves, along with a fine gaggle of others, will be performing for those with a noisier persuasion. 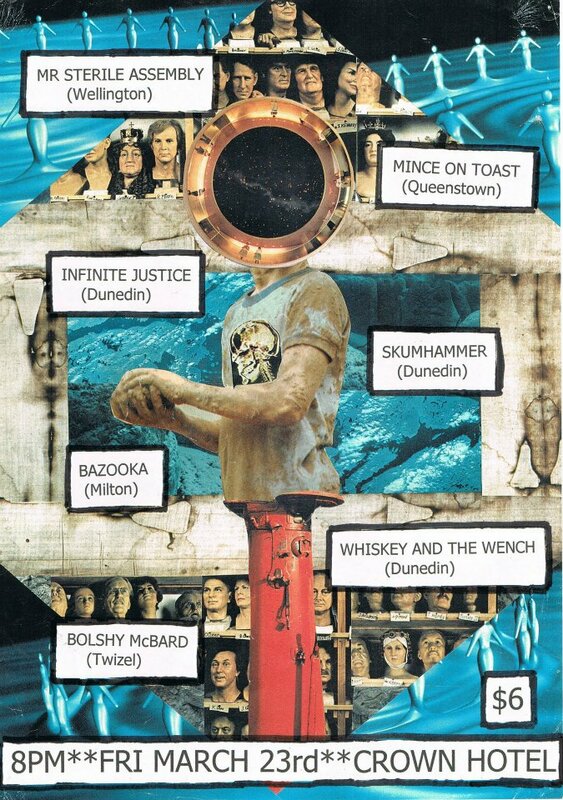 The line-up is epic, featuring Mince On Toast (Queenstown), Infinite Justice (Dunedin), Whiskey And The Wench (Dunedin), SkumHammer (Dunedin), Bazooka (Milton), Bolshy McBard (Twizel), & us!. Epic I tell you, epic. UPDATE: Breaking news!!! Generic Hole from Invercargill will be gracing the stage with there two piece mayhem. Can I get a Hell Yeah! On Saturday 24 March, after the afternoon talk, we hit the road and return to Invercargill! Playing at the Players Bar, in the backroom, we entertain the locals with Bazooka, Bolshy McBard, Generic Hole & Mince On Toast.